IoT (The Internet of Things) Gateways are emerging in importance in enterprises with industry vertical applications and cross-platform solutions to improve the User experience and service delivery, having seamless information services and personalized services, expanding business capabilities in mobile, increasing the impact and usefulness of Apps, forming ecosystems, building communities, etc. The adoption of Smart IoT Gateways is going hand-in-hand with the proliferation of connected devices, the increasing value of information, the need to make it easy, quick and convenient for people to engage with your organization, to know, manage process, etc. 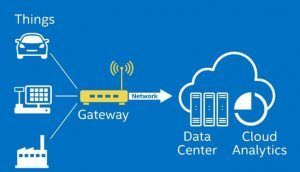 Fundamentally IoT Gateways connect IoT devices to the cloud and internal systems to add intelligence to an environment or process by providing connectivity and security while bridging different protocol adaptors with the many and different types of enterprise systems – internal and external (ie: AWS, Azure, Bluemix, etc.). While there have been IoT Gateways for a number of years, when and how to deploy them is new for many people. There are a number of factors to consider when assessing the potential for an IoT initiative to improve business outcomes. In the way of insight, while Traditional gateways provide basic functionality, today’s Smart IoT Gateways add important functionality with processing and analytics of data at the edge capabilities to reduce latency and increase IT value to the organization. They can ” select ” or “edit” the data flow to pass on only what’s most relevant – to prevent IT systems from being deluged by data not needed for the Mobile App / Desktop Application. Smart IoT Gateways have become the go-to technology for environments with many sensors and where real-time responses to events or data are required. And while it’s the early days of IoT, as use cases and technologies proliferate, IoT Gateways will be evolving with newer products designed to support multiple use cases across various domains (ie: smart homes / buildings / processes), in energy, across industrial scenarios, etc. – that require various Connectors as well as REST API-based SDKs for application development. Additionally, newer Smart IoT Gateways support all major interfaces and can handle software upgrades, semiconductor platforms and a wide range of devices. With modern IoT Gateways quickly performing crucial edge analytic functions , this is a major factor behind their rapid market adoption. They analyze data coming from a device before it is sent to the cloud, meaning analytics are performed faster and without the need for vast amounts of storage and processing power. Programmable edge analytics help implement innovative use cases in a short time frame, and are particularly attractive in situations where autonomous decision-making is required for critical operations. One of the main benefits of the IoT gateway is added security. Gateways both protect data in the cloud or travelling to the cloud, as well as ensure that external unauthorized parties do not attack or take over IoT devices. Gateways help with compliance, too, a huge benefit given the complex privacy and data governance issues surrounding types and location of data. They are configurable to comply with standards (such as those defined by oneM2M) and to support proprietary interfaces. IoT Gateways have an important role to play in product realization since Gateways with pre-integrated protocol interfaces and use case scenarios (ie: smart metering, smart parking, etc.) can reduce time to market by four to six months. Further, the new breed of IoT Gateways can speed things up. with a modern gateway architecture that enables organizations to add new protocol interfaces much more quickly. Portability across multiple OS and pre-integrations with SoC platforms also speeds product realization with a significant reduction in the total cost of ownership when deployed across multiple product lines. IoT Gateways have significant appeal since they enable organizations to ” add intelligence to processes / products / services “. While sensors and edge analytics are a double-edged sword , great efficiencies are gained in terms of speed and processing power – at the expense of a lot of data being “ left behind ” as the “ relevant ” is processed on internal systems or in the cloud. That’s great for many situations, but the added IoT capabilities may not be needed when the application is basic or there is little expectation of change going forward, when the device has enough built-in storage, when the network has sufficient bandwidth, or when the task in question does not require a great deal of processing. However, these scenarios are decreasing because of increasingly demanding User, business and compliance requirements. With this, the advanced functionality and processing capabilities of Smart IoT Gateways have huge appeal since they enable organizations to extend the capabilities with Digital Platforms and to deliver a great User Experience.